UPDATE, November, 2015: The article below was written for Arduino IDE versions, prior to 1.6.4. If you are currently using Arduino IDE 1.6.4, or later, follow the instructions in blog post instead. This tutorial is based on the steps I took to program an ATTiny85 with my Arduino Uno and use the nifty little chip for a small line following robot. 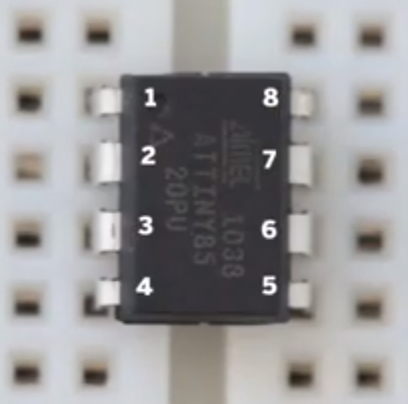 The idea for using the ATTiny came from the MAKE magazine and more specifically their “How-To: Shrinkify Your Arduino Projects” YouTube video. The ATTiny libraries for the Arduino IDE come from the High-Low Tech group at the MIT Media Lab. They have some other interesting materials for Arduino on their site as well. In order to test the set-up, we will upload the Blink example to the ATTiny. For this optional step, you will need a LED and an appropriate current limiting resistor. Make sure you are running the latest version of the Arduino IDE (1.0.5 when this was written). The steps should work for 1.0 and above, but some menus may be slightly different. Copy the “attiny” folder (not the attiny-master folder) from the unzipped ATtiny master.zip to the “hardware” folder. You should see a number of ATtiny entries in the menu under “Tools” > “Board” menu. 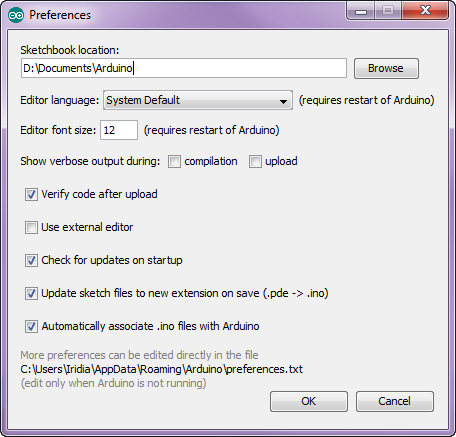 Open the ArduinoISP sketch from the Examples (“File” ->”Examples” -> “Arduino ISP”). Select the board and serial port that correspond to your Arduino board (e.g Arduino Uno). If you have not reviewed the ATTiny85 data sheet already, it is a good time to do so now. The ATtiny85 has 8 pins as per the diagram below. Pin 1 on the ATiny is marked on the chip by a small dot. Wire up the ATTiny and the Arduino Uno as per the diagrams below (sources High-Low Tech group & MAKE). Connect a 10 uF capacitor between “Reset” and “Ground” pins on the Arduino Uno board as shown in the diagram. The stripe of the capacitor with the negative sign (“-“) goes to the Arduino “Ground” pin. This prevents the Arduino Uno from resetting and ensures that the Arduino IDE talks to the ArduinoISP (and not the bootloader) during the upload of the sketches to the ATTiny. Connect ATtiny Pin 1 (with the little dot) to Arduino Pin 10. Connect ATtiny Pin 5 to Arduino Pin 11. Connect ATtiny Pin 6 to Arduino Pin 12. Connect ATtiny Pin 7 to Arduino Pin 13. 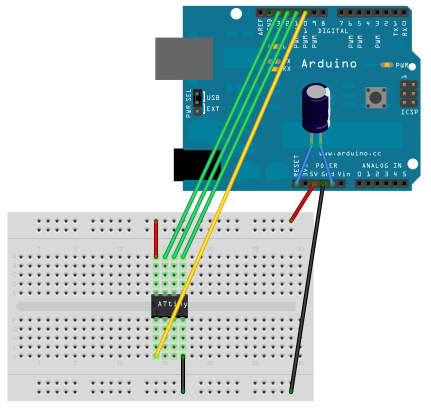 Connect the ground and 5v from the Arduino to the breadboard. Connect ATtiny Pin 4 to ground. Connect ATtiny Pin 8 to 5 volts. Now it is time to test the set-up, by loading the Blink example on the ATTiny85. 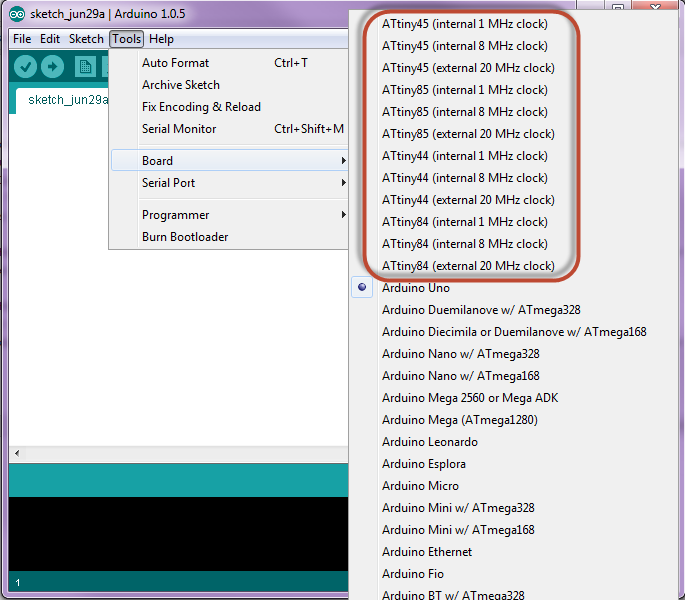 Go to Tools -> Board and select “ATTiny85 (internal 1 MHz clock)”. There will be several entries for the ATTiny85, so make sure you have selected the one with the 1 MHz clock. You may get an error like this: “avrdude: please define PAGEL and BS2 signals in the configuration file for part ATtiny85”. You can ignore it for now. Connect an LED and a resistor between pin 3 of the ATTiny85 chip and ground and power up the ATTiny85. If you see the LED blinking, you have got the set-up right! In part 2 of the “How to program ATTiny85 with Arduino Uno” tutorial I cover the steps to make the ATTiny85 run at 8 Mhz and get it ready for more interesting projects, like a little line following robot, for example. Thanks for this tutorial, but there’s a noticeable fault in the timing. i’ve programmed it to blink every 1 minute , and it blink after shorter time. Which programmer selection should I choose? ArduinoISP? Arduino as ISP? ??? On step 3. Yes, the shield just replaces the breadboard and wires, other than that the connections should be the same. I tried to program Attiny85 with this method but there is error when I press the upload button. Hi Waqas, which version of the Arduino IDE are you using? This articel is for versions prior to 1.6.4, as per the note at the top. You should follow the instructions here http://42bots.com/tutorials/programming-attiny-ics-with-arduino-uno-and-the-arduino-ide-1-6-4-or-above/, if you are running a current version.